Synopsis: Two women from the city of Toronto, Canada travel to a small rural area in Ontario. The journey starts off as a means to film a travel documentary, but along the way they end up learning more about each other, and themselves. Please feel free to tell me your thoughts/critiques, so that I can improve when I make another visual novel. Last edited by Katy133 on Thu Mar 12, 2015 1:49 pm, edited 1 time in total. Umm... I played your VN (The Journey of Ignorance) and I uncovered quite a list of bugs, some are minor but others are pretty major. mugenjohncel wrote: When you save a game at some points in the game and load it again from the main menu... the game will load and everything except for the BG Graphics. Thank you so much for spotting that! I've gone back and fixed what I could of the background error (I did this by replacing the default black background to each of your VN’s “pages” in Novelty with a custom background). This fixes the majority of the background-loading issues (not all of them, because of the way I structured the "pages" of the VN), but now I know how to properly structure the page layouts in Novelty so that this problem won't happen at all in future VNs I make. 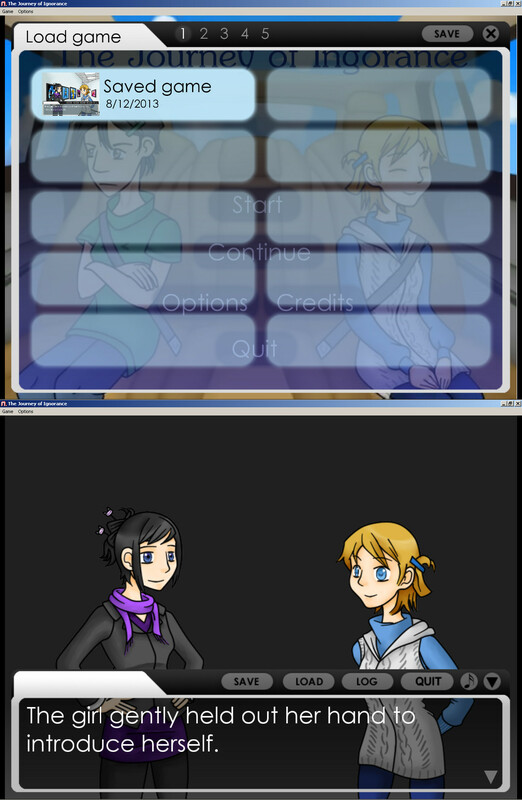 Yes, when I export the Novelty file as a completed visual novel, the program automatically adds a quit button at the top of the screen. I don't know how to remove it; I've been trying to contact Novelty's dev team and join Novelty's forum to ask how to remove it (I've seen it in other Novelty-made games as well), but so far, I haven't been contacted back or been registered to the forum. If any Novelty-users could help, I'd appreciate it. Sorry it caused a crash. The only way to make sure you can quit without the game crashing is by using the custom quit button I added in (the one right above the dialogue box). I wrote about this in the ReadMe file attached to the game folder. I'm still very interested in feedback for The Journey of Ignorance; it'll help me with writing my next visual novel. Update: The Journey of Ignorance is now on Itch.io!